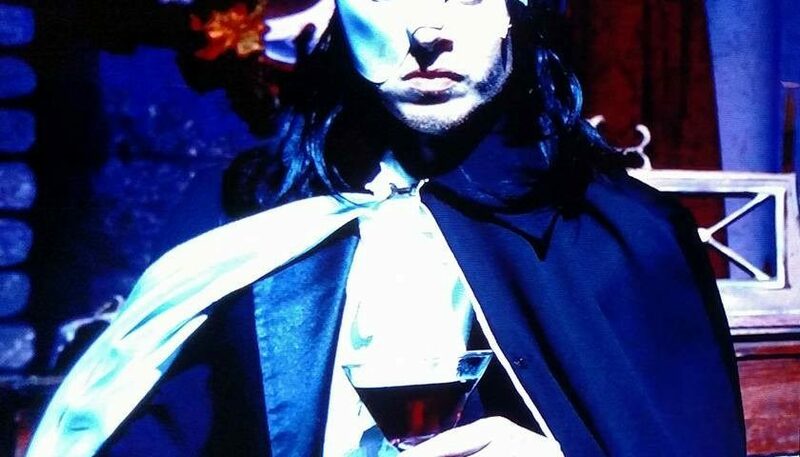 My 26-year-old son did these things onstage as the Phantom of the Opera in Yeston & Kopit’s Phantom, but the fact that he was acting made it no less difficult to watch. I found myself empathizing with Erik, as this (superior) version of the story’s Phantom is named, and wishing for a way for him to “win” even though I knew in my heart that he couldn’t. Or could he? Anakin Skywalker was eventually redeemed, and I wonder if Kylo Ren ever will be? Weston & Kopit’s Phantom is a very different telling of the familiar Andrew Lloyd Webber Phantom of the Opera tale. The latter is larger than life and mysterious, sad in his own way. Pathetic. But we don’t understand him, and as many times as I’ve seen that production, I don’t believe I’ve ever really felt compelled to try. This Phantom, however, is multi-layered and real, and he has a name by which he is referred both in the program and onstage. This phantom isn’t just a monster with a great costume and magnificent singing voice; this phantom is an everyman who was born with a hideous facial deformity that dictates his life. This Phantom is also a son. Played by my only son. My boy has a knack for some of the more gut-wrenching roles out there. Though he’s played some good guys over the years and played them well, he has also played a few larger-than-life villains: Gaston in Beauty and the Beast as well as a slew of dark Disney characters, Javert in Les Miserables, Father in Ragtime who may not be a villain, per se, but was painted as one in my son’s recent national tour, and now the tragic Erik, the Phantom (currently playing at Dutch Apple Dinner Theatre in Lancaster, PA!). Perhaps it was the mask he wore without my seeing a glimpse of his full, handsome face, but more than once, I thought of two onscreen mothers whose sons did unspeakable things while hiding behind masks. Shmi Skywalker died believing her son to be a hero. She only knew him briefly as handsome, beautiful Anakin, but we know that her death was at least part of the impetus for Anakin’s turn to the Dark Side. It makes perfect sense that Anakin committed his first acts of evil while he was still beautiful, a nod to the tragedy of his turn. When we think of Anakin committing his first sins before the mask, it is even more interesting that Kylo Ren chose the mask without the physical need. Why? It’s clear that he admires his grandfather in a sad, twisted way, but what did he admire Darth Vader for, exactly? Did he really admire his grandfather’s evil, and that’s why he chose a similar costume? Perhaps it was to hide from his mother, Leia. And what about the change of name? Did Ben choose a new name for his Dark self because he didn’t need to cover a physical deformity? Did he simply think it was cool? I’m anxious to find out. Which function does a mask serve, really? Does it cover infirmity of some sort, whether it is physical (Anakin and Erik, the Phantom) or emotional alone (Kylo Ren)? Or does it do more to spotlight the individual? I thought long and hard about this while watching my son perform Phantom. Would the world have been so unaccepting of his assumed ugly visage if his father had never covered it? Many people would still cringe at the sight of him, but others would come to know and understand him just as he is. Think: Vanessa in Deadpool. How about Anakin? His need for the mask is life-sustaining, but it is also larger-than-life. It’s worth noting that the apparatus that the Emperor chooses for Darth Vader is imposing. I’ve never thought that the black suit is standard burn victim gear, have you? What about Kylo Ren’s mask? He actually scares me more without the mask, the intensity of his stare and breadth of his emotions on full display. Ben wears no mask as he brutally murders his father. With it, he seems more like a Darth Vader wannabe. Without it, we can see the evil reflected in his face. And what of Leia? She never seems to acknowledge Kylo Ren. To her, that person is Ben, first and foremost. Her sweet boy. Her son. Why else would she ask Han to bring him home? Clearly he has killed a lot of people, but she must see through the muck of the evil he’s done to the Light she believes to remain in his soul. That’s how I felt about the Phantom as I watched my son portray him. I’m sure that’s also why I understand Anakin no matter how cruel he is as Darth Vader. In spite of the muck and the masks, there is Light hiding underneath. So many characters we know and love wear masks. They hide identities and deformities, passion and pain. In the cases of Anakin, Ben, and Erik, would they be better understood if they never wore masks, no matter how “ugly” they appear? Perhaps if they had risked it, they would truly know the power of unconditional love. And remember. Coffee With Kenobi. This IS the podcast you’re looking for. Whoa, what an amazing opportunity to see your son in that role. It must have been incredible! And then to have all of those insights into the role a mask plays in SW as you were watching… So cool! Something that popped into my mind is how the anonymity of the Internet is like a “mask” people can put on. I was just listening to a cyber psychologist talk about how behavior changes online. I think we all have experienced that. People can do and say things they never would in person because it’s just too easy to hit that send button. The cyber mask gives more free rein to the dark side. I bet real masks do the same thing…which makes Kylo’s act at the end of Force Awakens so interesting. It was oddly intimate on its cruelty, not distant. So much to think about. Awesome entry!!!! Thanks so much, Erica! I always love seeing Troy onstage, but this role was particularly powerful on many levels. I so agree about the intimate cruelty of Kylo Ren’s acts without his mask. I also agree that the internet can be a mask, but I have come to believe that it is mostly a mask for those would would also wear one in person. Mostly. The cyber mask does make bad decisions far too easy. That’s a fact. As I read your moving words, I was transported back in time … to not too long ago (last night, to be exact) … which found Tom and me watching a cable television show, a police drama, depicting the tale of a squad of detectives trying to sort out a series of brutal murders (what light fare we enjoy watching! 😉 ). The squad’s captain was attempting to ascertain some vital information from one of the murderer’s (yes, there is a cadre of “bad guys”) mothers, and that mother states (something akin to): “Captain, you see my son as a murderer. I see the little boy who smiled a lot, whose knees I bandaged…” Yes, she admitted she knows the atrocities of which her son was a part, but she can’t help but see him in a different way, the “before” picture. With that in mind, I definitely can see why Leia would see the individual who became Kylo Ren as her beloved son, Ben. In Anakin’s/Darth Vader’s case, of course, he needed help to keep alive. The Emperor knew exactly what he was doing — make his protégé as menacing and evil-looking as possible. That intimidating mask/costume did more to instill fear in the galaxy than anything else, I’d say. Yes, I realize that there are individuals out there who wear an “invisible” mask — those who are good at hiding their true selves behind a visage that masks their true intentions. That takes an awful lot of energy. I’d hate to go through life that way. Thank you so much, Melinda! I see that “before” picture often when I watch tales of Dark characters and their evil deeds (have you watched Stranger Things?….really good show! More darkness…still making my way through it). How do sometimes well-loved children turn out so evil? Why?? Why?!?! It breaks my heart for everyone touched by that evil. You make such a great point about the eyes, and that is one thing that sets Anakin and Kylo Ren apart. We *can’t* see their eyes in those masks. In the case of Erik, the Phantom, Christine actually makes a comment about the kindness she sees in his eyes as he wears the mask. It makes what happens next all that much more tragic. You’re right. It would be exhausting to wear a mask all the time, both physically and emotionally. I’m so…heart-on-my-sleeve “out there,” though, that sometimes I wish I could successfully wear a mask. The thing is that it would have to be permanent, wouldn’t it? Everyone’s reality comes through at some point. No one can hide forever. Why indeed do sometimes well-loved children turn out so evil! 🙁 It is a mystery that probably will go down in the annuls of Time. Thank you, again, Melinda. I truly appreciate your kind words. Zero irony that we’re watching similar shows! I’m only through episode 3 of Stranger Things, unfortunately, because my husband and #5 child are watching it, too, and we’re never home together for long during the week!! The question about well-loved-children breaks my heart. It truly does. So many great thoughts here already! This is, by far, my favorite of all your blog entries…and they’re all amazing! The associations and analogies you made between SW and your baby boy’s performance are not only spot-on, but a true testament of a mother’s love for her son, no matter what he’s done. Not acceptance, necessarily, but love. I’m also neck-deep in a series called The 100 right now, and there are a lot of moral and ethical issues surrounding family members and the decisions with which they are faced. Very intense. I agree with you about Ben/Kylo. I think he’s more frightening without his mask. He’s also more human, which makes him likable…as much as I’d like to hate him completely, I can’t. It’s the eyes…(which has already been mentioned, so I won’t repeat too much). I can’t help but point out the end of Beauty and the Beast, in the scene when Belle looks into the Prince’s eyes after his transformation from Beast…he says “it’s me”, and the only way she believes it is by looking into his eyes! One of the most freeing times I’ve ever experienced was when I dressed as Darth Maul. I always feel strange looking at people (mom always taught us nother to stare), but I felt so powerful in a way, being able to hide behind that mask, not letting anyone know who I really was!! As you know, I teach about self-esteem building in one of my classes. In it, we watch “The Breakfast Club,” and talk about the “masks” each character wears, based on their social clique (Princess, Brain, etc. ), and how those social masks can shape our self-concept…it always generates a lot of great discussion! Even though the movie was released in 1984, it’s message and ultimate moral lesson is timeless! Again, GREAT piece, Pam!! One day, I’ll finally get to see that boy of yours perform in person!! Thank you so much for your kind words, Jay. So much. I keep seeing the ads for The 100 and know I’ll get to that series soon, too! The scene you mention in Beauty and the Beast where Belle recognizes her “beast” in the Prince’s eyes….I thought about that same scene while watching Troy in Phantom. The eyes are so important and speak volumes about the heart inside the person. This begs the question, “can intrinsically good people do bad things?” and of course the answer is yes. With unconditional love, however, their sins can be forgiven. EVERYONE needs to know that unconditional love. You bring up such an interesting point about how you felt behind Darth Maul’s visage. I can certainly understand feeling powerful behind that mask. Wow! Reflecting on my own feelings, however, I think I’m more uncomfortable in a mask. You’ve really got me thinking about the “whys” associated with choosing to wear – or not wear – masks. The Breakfast Club sounds like the perfect vehicle for your self-esteem building discussion, and I’m sure you use it so well. Thank you, again, for your comments.